When Irresistible Me contacted us asking if we could review one of their products, me and Lucy were beyond excited! They have kindly sent us a hair iron which I will be reviewing in this post. Keep on reading to see what I think of it! 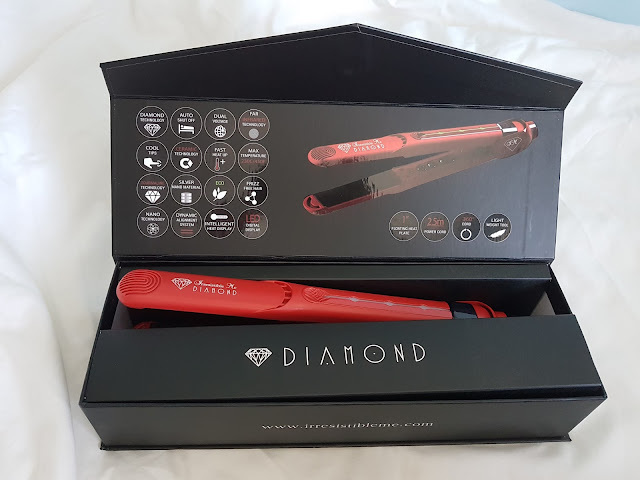 The hair iron we were sent is the Diamond Professional Flat Iron. The ceramic plates are coated with crushed diamonds and tourmaline and the purpose of this is to protect your hair and lock in any moisture and hair oils to keep your hair looking glossy! The straightener gets up to 230 degrees Celsius (450 degrees Fahrenheit). In terms of the price, it costs $149 which is just over £110 pounds if you're from the UK. The straightener itself has a really pretty design with a light up indicator as to how hot it is. When I first held it, it definitely felt quite plastic for a straightener of this price, but when I came to use it, I realised that it meant the straightener was a lot lighter and easier to use. When I turned the straighteners on, they heated up super quickly which is always a bonus because no one wants to be waiting around! There was a slight 'plasticy' smell once the straighteners had heated up, but it was nothing too major and it didn't really bother me. I put the straighteners straight up to 200 degrees celsius and this temperature seemed to work perfectly fine for me, however maybe next time I'll put the temperature up slightly higher so I can get a better finish. As you can see, I have thick curly hair (in fact you can't even see all my hair these photos, I still have some at the front...) so the flat iron did a really good job of straightening my hair. I spent around half an hour straightening my hair which is less than usual and I'm sure if I spent more time, I could have gotten a better finish than this. It definitely made my hair look glossy and shiny so the diamond technology really is quite good! 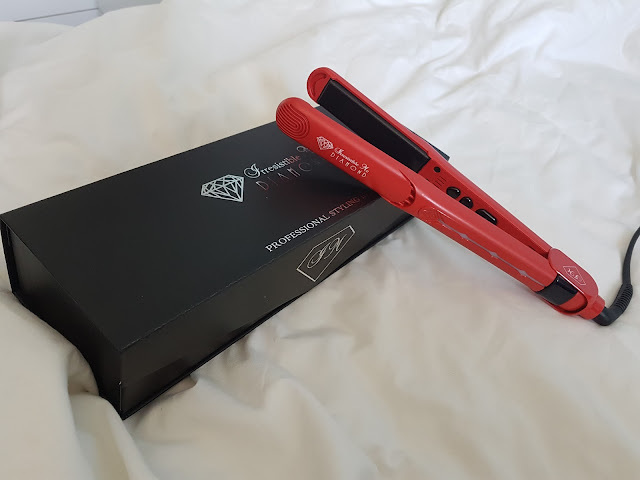 Although this wasn't the best straightener I've ever used it, it was definitely a good one and if you're looking for a new hair iron, then I think this is one that you could look into. As with anything though, there are a couple of cons. The main one for me was that my hair did feel slightly oily afterwards, nothing too major and I'm sure if I had washed my hair that day then it would have been fine. Lucy has a more oily hair type compared to me and definitely made her hair feel even more oily so the only thing I would say is to definitely keep that in mind if you have that particular hair type. I have quite dry hair so it was fine for me as it just made my hair more silky and glossy. The other con was that it wasn't the best at straightening my baby hairs and it did make my hair slightly static (which it does claim not to do). I do have curly hair which is prone to frizz though so that might be why. Overall, I think it was a pretty good straightener despite the few downsides which I have mentioned. If you are looking for a new hair iron, then maybe have a look at this one and compare it to some of the others you've been looking at! 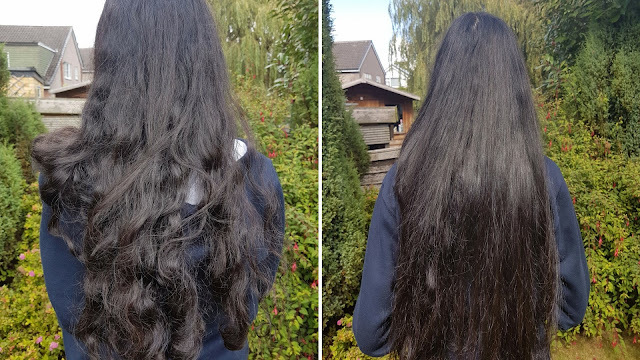 Disclaimer: The flat iron was kindly sent to us by Irresistible Me, however all opinions are our own and we have given an honest and detailed review. A big thanks to Madison who made the whole process easy and fun to do! What straighteners do you usually use? Quick message: I wanted to quickly say thanks to 'GingerSnapHattie' for nominating us for the blogger recognition award. We have already done the tag so won't be doing it again, but I did want to mention her in this post to say thanks and also to tell you guys to check out her blog because I'm sure you will love it just as much as I do!